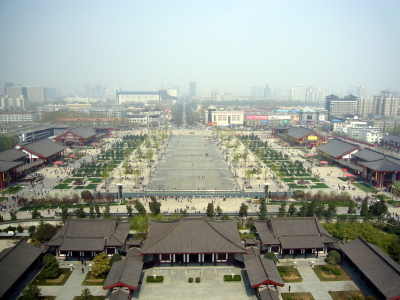 I hadn’t realised just how much of Xi’an lay outside the city walls until my last day there. I walked south from the South Gate of the city in a zig-zag until I reached the Big Wild Goose Pagoda—which turned out to be much further than I’d anticipated from my not-to-any-particular-scale map. On the way, I passed through an electronics district, and paused to listen to some amateur Chinese hip-hop on a Samsung-sponsored stage at the side of the street. I’d definitely have missed that if I’d taken the bus! Getting into the pavilion itself is a bit confusing: first you must buy a ticket (RMB 25) for Daci’en temple, whose entrance lies on the south side of the surrounding wall. 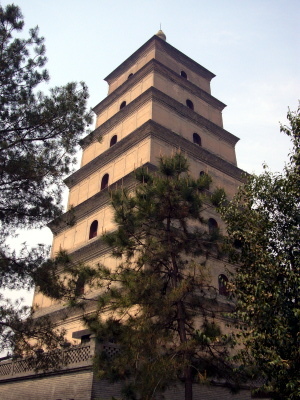 Once inside, you can then buy a second ticket (RMB 20) to climb the tower’s seven floors. It’s quite an exertion, but the view from the top is as good as you can ever get in north-eastern China. On my way back, I had intended to visit the museum a couple of blocks away, but it wasn’t to be. When I arrived, I found a confused crowd milling around in front of the museum, and security guards preventing anyone from buying tickets. I don’t know what was going on, but it was apparent that I wasn’t going to get in.